Uber drivers are striking across the UK over the next 24 hours as the company continues to appeal against a court ruling giving them employee rights. Although not all of the ride-hailing company’s drivers will be on strike, members of the Independent Workers Union of Great Britain (IWGB) will not be using the app for 24 hours from 1pm on Tuesday. Instead, they gathered outside of the company’s offices in London, Birmingham and Nottingham to demand fairer pay and to be treated under the conditions of a 2016 court ruling. The IWGB is calling on potential passengers to show solidarity with striking drivers by not using the app during this period, as it calls for the company to cease delaying the implementation of the court ruling. Uber lost a court battle two years ago when an employment tribunal found against its classification of drivers as independent contractors, although the company continues to appeal against that ruling. James Farrar, IWGB’s united private hire drivers branch chair, told Sky News that despite the court ruling Uber was required to class its drivers as “limb b workers” – entitling them to the minimum wage and holiday pay – Uber’s continued appeals have meant that ruling has not yet been implemented. The strike on Tuesday is the first time that a trade union has taken action against Uber. Speaking during the demonstration outside Uber’s London offices, Mr Farrar told Sky News Uber was only paying heed to complaints ahead of an Initial Public Offering next year. He said: “Uber has done just about enough, or what it thinks is just about enough, to keep the investors happy while it heads for an IPO next year. “The trouble with these so-called benefits is that they’re fleeting and they can be taken away or they can be given to some people and not to others, and we really don’t have any say. “What we want is our statutory rights, not just some fiddling around the edges. We want Uber to obey the law, give us our statutory rights, to be paid fairly and to have holiday pay. The union is currently engaged in legal efforts to secure private hire drivers’ rights through the courts, and has cases against Uber, Green Tomato Cars and A2B Cars. Earlier this year, Uber’s UK boss admitted the decision not to renew its London licence last year was correct, as the company attempted to address negative press. Labour’s shadow chancellor, John McDonnell, tweeted that he supported the strike for better employment rights and urged others to respect the picket line. The industrial action comes as multiple groups involved in precarious work as part of the so-called “gig economy” seek to assert stronger statutory rights. In June, Sky News reported how Deliveroo was set to pay a six-figure bill to settle an employment rights battle brought by dozens of ‎its riders, underlining continuing tensions over the treatment of gig economy workers. Just months earlier as snow and ice gripped the UK, Sky News reported how gig economy workers were risking their safety in dangerous conditions because they fear losing a day’s wages. 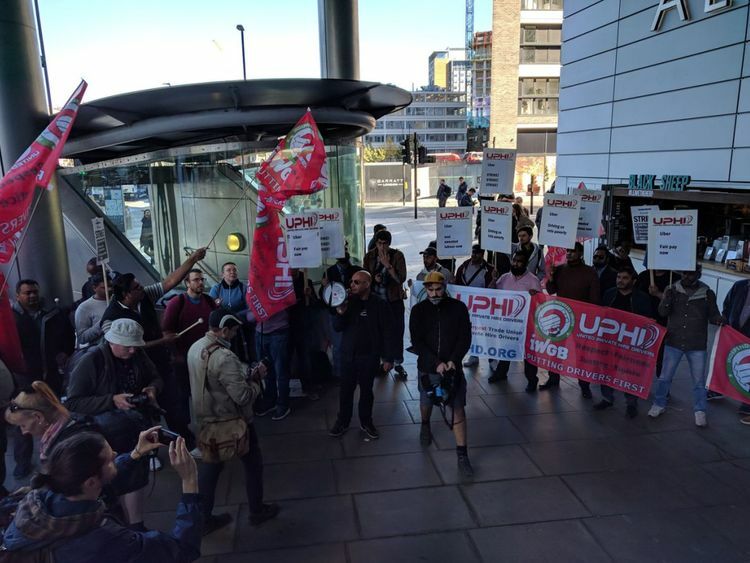 In January, outsourced workers at the University of London campaigned to be brought in-house, holding a strike on Thursday to demand statutory employment rights. Uber drivers and passengers reacted to the strike on Twitter, with some echoing the IWGB’s complaints while others said they were comfortable with the firm. Sky News spoke to a Birmingham driver called Darren who said he would not be supporting the strike. “Drivers have choices, they can always go back to traditional bases if unhappy,” Darren told Sky News. 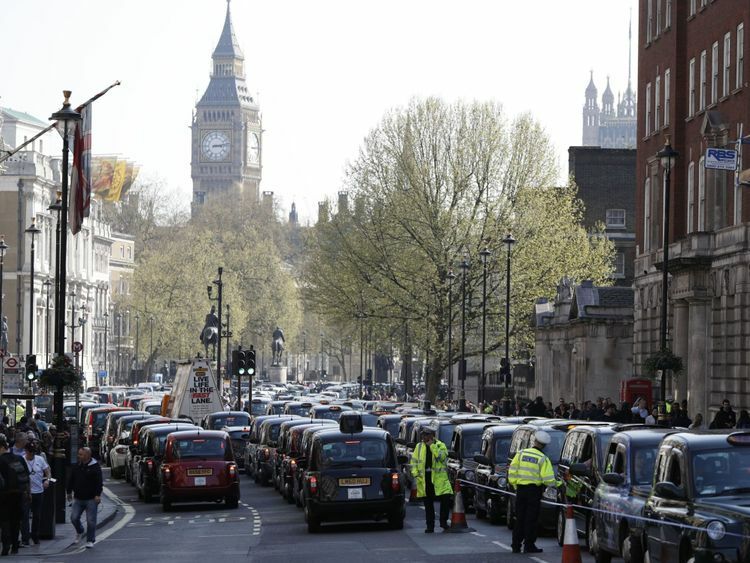 Steve McNamara, general secretary of the Licensed Taxi Drivers’ Association which has organised mass black-cab protests against Uber in Westminster, told Sky News he shared some of the drivers’ criticisms. “Since it first came on to our streets, Uber’s aggressive business model has forced its drivers to work dangerously long hours in order to make ends meet, putting passengers and other road users at risk,” said Mr McNamara. “Uber claims that its drivers are self-employed ‘partners’, and has made clear that it will continue to fight any court ruling that says its drivers are workers and entitled to the associated workers’ rights.